Bonnie June Brower Rains was born May 25, 1928 to Rupert and Maggie Budd Brower and passed away in her home on November 28, 2012. As a girl she attended grade school at the Gordon schoolhouse and then graduated high school from El Dorado Springs in 1947. She was saved when she was nine years old at the Flat Rock schoolhouse in Pleasant View during a holiness revival. She attended church at Oakdale Holiness church while growing up along with her siblings, parents and grandparents. Bonnie was united in marriage to Joe Donald Rains on June 18, 1947. They had three children: Jimmy Allen, Donnie Joe, and Jackie Kay. She loved them very much. They attended West Union Missionary Baptist Church as a family where she taught the little children’s Sunday school class for years. She remained an active member all of her life even including this last Sunday. Granny was very proud of the fact that all of her children and grandchildren attend church regularly. Going to church and knowing that all of her children and grandchildren were saved was the most important thing to her. One of her biggest joys was cooking Sunday dinner every week for her family. We spent many of those Sundays at her special Granny rock on Cedar Creek for picnics. She had eight grandchildren who she also loved and enjoyed. They spent a lot of time at her house. She was known as Granny to them and all of their friends. She was not only their Granny but their very special friend and number one prayer warrior too. She treated them special and let them have the run of the house when they came. There were many programs in the basement, roller-skating, Big wheel races, popovers and she was always ready for a good game of Mother May I or Books. Papa Joe and Granny always took all the grandkids to the annual Cedar County Fox Hunt every summer for the hunt and a campout. She could fry an egg like no one else. She meant the world to all of us. She and Joe Donald lived and worked on their cattle and wheat farm for fifty-four years. She was quite a brush sprayer and picked up many a rock. They moved to town in 2001. Then after losing Papa one of the highlights of her week was going to the Senior Center and playing a good game of cards with her special friends. Also, in her more recent years her happiest times have been watching her great-grands grow up. She was literally laying up prayers for them the day she passed away. Granny went on to her heavenly reward in her home surrounded by her family. She said earlier that very day that she was a winner either way. She could stay here and enjoy her family or go be in heaven with Papa Joe. What a glad reunion day. Bonnie is preceded in death by her husband Joe Donald, “daughter” Ruthie Rains, and brothers and sisters-in-law Merle, Leona, Ernie Dale and Mary Brower. 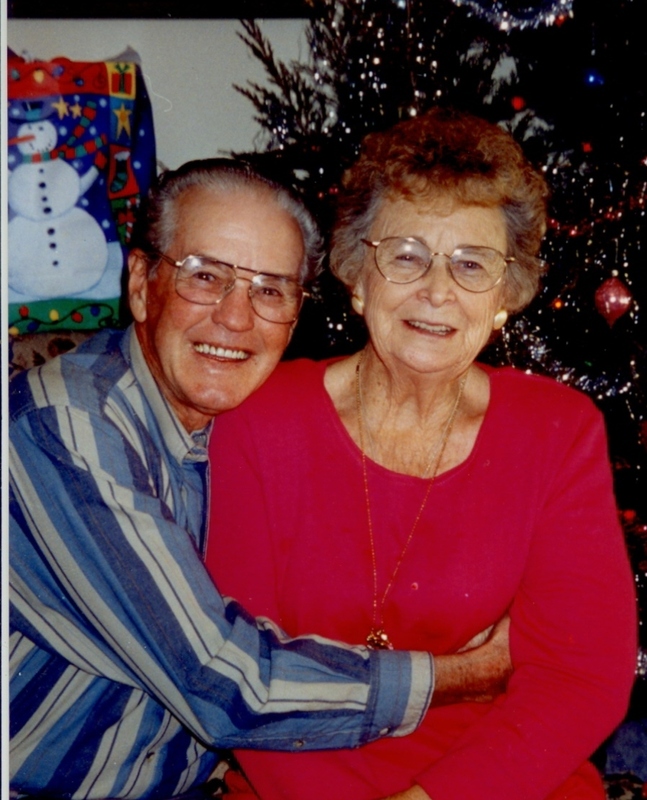 She is survived by her children: Jimmy and Jena, Donnie and Karen, Jackie and George; sisters and brother-in-law: Dolly Hague, Betty and Alden Sallee; aunt, Marge Goodwin; grandchildren include: Shawna and Len Bridges, Brandi and Travis Bradley, Chad and Trish Boyles, Stanton and Sara Rains, Lori and Justin Sifford, Kenton and Jennifer Rains, Amy and Darren Mead, and Clayton Rains. Great-grandchildren are: Holden and Neely Bridges, KaLee and Mat Wisner, Rylie and Connor Bradley, Hunter and Tanner Boyles, Trenton and Weston Rains, Harrison and Jackson Sifford, Preston Jack and Zoe Rains, Gracie Ruth and Lane Mead, and Liam Beau Rains; step-grandchildren: Shawn and Ben Beaman, Davis and Andrew Worthington; step-great-grandchildren: Kaytlynn, Tye, and Cole Garretson; and many nieces and nephews who spent time in her home while growing up. She was an amazing example to us all and a faithful servant to the Lord. She was one special Granny Grow and was loved by all who knew her. She will be so greatly missed. Funeral services were held Saturday, December 1, 2012, at 10:00 a.m. at West Union Missionary Baptist Church with Bro. Ralph Benham officiating. Karen Rains, Lori Sifford, and Kenton Rains provided music. Burial followed in Mound Cemetery under the direction of Bland-Hackleman Funeral Home. Pallbearers were: Stanton Rains, Kenton Rains, Clayton Rains, Chad Boyles, Travis Bradley, Len Bridges, Darren Mead, and Justin Sifford.